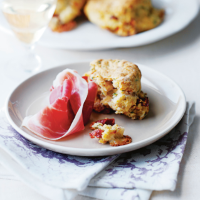 Taleggio cheese, basil and tomato give a Mediterranean flavour to these scones, which are great served warm with Serrano ham. Preheat the oven to 220°C, gas mark 7. Line a large baking sheet with baking parchment. Place the flour, seasoning, bicarbonate of soda and butter in a large mixing bowl. Rub together with your fingertips until the mixture resembles breadcrumbs. Fold in the buttermilk, cheese, tomatoes and basil, then lightly knead until you have a sticky dough. Turn the dough out onto a floured board. Dust the top with a little flour then use your hands to press the dough evenly into a round, about 3cm deep. Using a 7.5cm cutter, cut out 8 scones, gently reforming the off-cuts as you go. Place on the baking sheet, spacing them out well, and bake in the oven for 15 minutes until golden brown. Serve warm with the Serrano ham. For best results, scone dough should be handled very lightly, to avoid over-working it.